The year has rolled around again and my blog is getting alarmingly close to being two years old (November 23rd doth approach…) which can mean only one thing – it’s almost time for Movember. I looked out the window this morning into a fog layer deep enough that seeing the ground from 6 floors up wasn’t guaranteed and remembered that soon my delicate face will be exposed to the biting elemental fury that is a mild British winter. Fear for my chins, dear reader, fear for them. November is done and my moustache has grown. My razor has now been put away, my beard is growing and sensation has started to return to my cold, cold face. 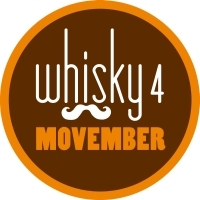 The Whisky4Movember team did well (and you can still donate to us if you feel the urge) raising £1800 between us, and I even managed to put £200 towards that total. September flew by a bit for me and shortly after I finished writing up last month’s Whisky Squad another one appeared on the horizon. In honour of the fluffy top lips of a chunk of The Squad this session’s theme was Movember. Whisky Gandalf Darren, the man behind Whisky4Movember and random chap for Master of Malt, had done some looking around and brought us four moustache related whiskies to try. 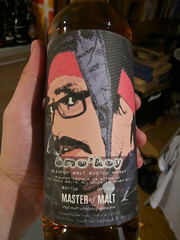 First up was one half of Master of Malt’s special edition pair of Movember bottlings for 2010. 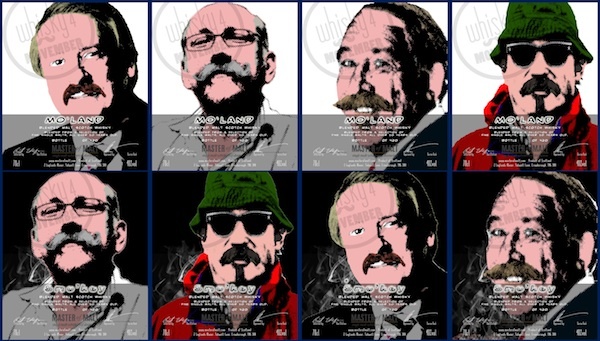 Selected by Darren, bottled by Masgter of Malt and featuring five different labels per expression, each honouring one of the well known moustached chaps of the whisky industry – Richard Paterson, Dave Broom, Charlie MacLean, Serge Valentin and Marcin Miller. 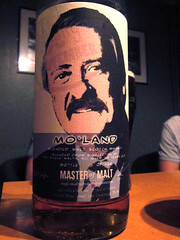 This first bottle was the Mo’land, a single cask lowland whisky, and our featured moustache was that of Richard Paterson who I’ve bumped into a few times over the summer. Richard is an especially appropriate candidate for honouring on the bottle as not only has he survived cancer but also removed his rather famous moustache for Movember. The whisky had a light nose with bees wax, butter, malt syrup and boiled sweets. To taste it started with a syrup sweetness which rolled through surprisingly rich polished wooden floors to a sweetly woody finish. Water brought out more butter and woody spice, with vanilla and a hint of fruit. A light and easy drinking dram that might entice whisky novices in as well as keeping me happy. We moved on to another moustachioed bottle, this time last year’s Master of Malt Movember bottling – M’Orkney. As a spooned malt from Orkney, mainly consisting of the more well known of the distilleries on the islands, it’s not that much of a mystery where the spirit came from. ‘Spooning’ is a brand protection practise where a distiller will add a spoon of another distillery’s whisky to a cask when they sell it. 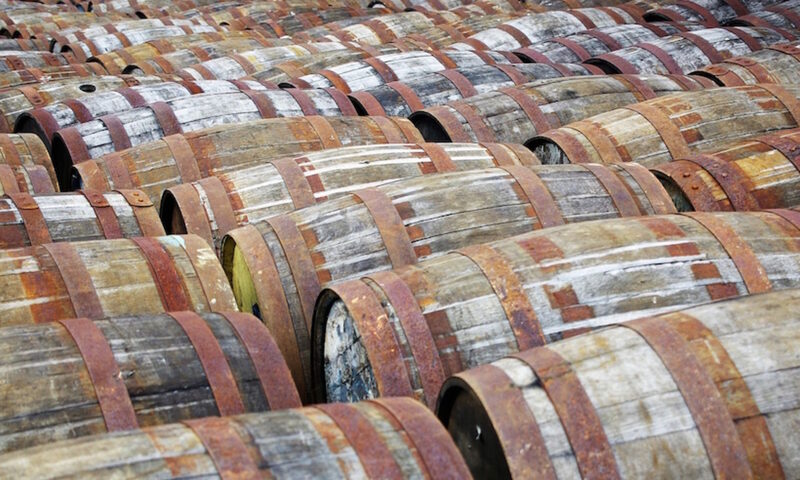 This doesn’t affect the flavour of the whisky, a spoon is very small in comparison to a cask, but it makes the whisky legally a blended malt and prevents the buyer, and whoever the whisky is eventually sold on to, from bottling the whisky and selling it under the original distiller’s name. Certain distillers are well known for blocking bottlings in this fashion, with Glenfiddich and Balvenie (both owned by William Grant & Sons) being two of the more famous. The addition of a drop of Scapa to a cask of Highland Park (let’s just say…) hasn’t made much of a dent in the M’Orkney, with a nose of stony peat, sweet smoke, super sour candy balls and a pinch of salt coming through. To taste it’s sweet with a controlled dryness. There was wood ash, peppery spice, a citrus tang and a prickly finish. Water softened the prickle and brought out more lemon and vanilla. Annoyingly this one is sold out or I’d be grabbing one for my cupboard. 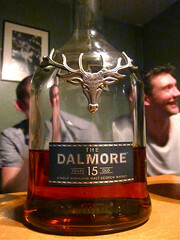 Next up was one of Richard Paterson’s whiskies – the Dalmore 15. A classic highland distillery, just down the road from Glenmorangie, Dalmore’s been in the news recently with the release of their newest whisky – The Trinitas. Named for the fact that there are just three bottles available it has taken the record for world’s most expensive whisky, at £100,000 for 70cl. Two of the three bottles are spoken for, one having gone to a private collector and one to Sukhinder Singh from The Whisky Exchange, but the other is still available from TWE, so If you’re interested you can give them a call. It looks to be a record that may not stand for long as Macallan’s ‘Cire Perdue’ decanter of 64 year old whisky has almost finished its trip around the world and will shortly be auctioned off in aid of Charity: Water – with 10cl samples going for over $40000 it looks like the whisky (with its rather special Lalique decanter) might break the Trinitas’s record. The rather more affordable Dalmore 15 is a rich deep red (although the colour is helped on its way with some added spirit caramel) with chocolate, cherry, shreddies and dry wood on the nose. To taste the cherries become glacé and are joined by almonds, ginger, orange and sweet spices – a bit like a rich cherry bakewell at Christmas. A bit of water, as it can’t take much before losing the richness, adds vanilla, more sweetness and some delicate dried fruit. 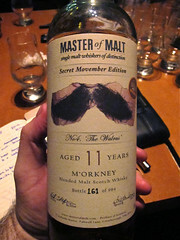 We then moved back to Movember whiskies, picking up the second of this year’s MoM bottlings – Smo’key. This was one was adorned with the face of Dave Broom. Dave is a well known drinks writer, especially known for his writing about whisky, which has appeared in pretty much every whisky publication under the sun, and also in a number of books, including his latest – The World Atlas of Whisky (which may shortly appearing on my shelf next to my World Atlas of Wine from the same series). The Smo’key is a blended malt like the Mo’land, but this time going for the opposite end of the flavour scale, featuring whiskies from Islay. On the nose there wasn’t all that much, with sweet mulchy peat and a touch of stone dust. The taste had much more, with sweet grassy peat, butter, sweet and sour oranges, a hint of coal and a vegetal back palate leading to a prickly finish. Water brought out more of the nose’s stoniness with some coal smoke. There was also more fruitiness and the butter gained some fat, making the mouthfeel creamy. Darren doesn’t know what whiskies went into the bottle, but after some discussion around the room it was thought that there was definitely some Caol Ila in there, cut with some lighter Blasda-like Ardbeg as well as a whole lot more. Our fifth whisky of the night, breaking the rule (as seems to have happen at most Whisky Squads) that we only taste four whiskies, was Smokehead Extra Black. 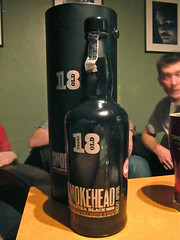 Smokehead is a range of bottlings by Ian MacLeod of whisky from an unnamed Islay distillery (it’s [almost certainly] Ardbeg). Along with the regular bottling and this 18 year old Extra Black they also used to do an Extra Rare, which I have a cloth bag covered bottle of in my whisky cupboard. Smokehead has been a great supporter of Movember this year, supplying whisky to a variety of the events celebrating the month, hence a bottle appearing at our table. On the nose it was sweet and lightly smokey, with a thin and nicely astringent smoke rather than a choking cloud. To taste it had a sweet start with TCP, tar, damp peat and wet smoke in the middle, and a sweet smokey finish. A bit of water brought oranges and a hint of lemon as well as a thick vanilla caramel. 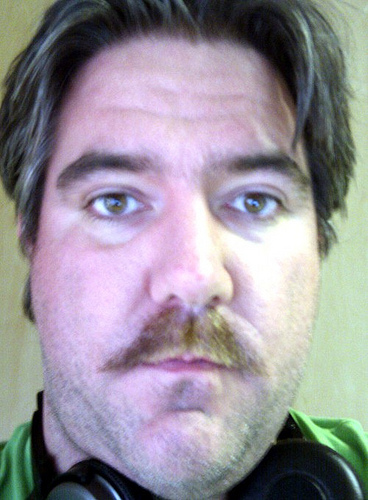 My Mo’ (I hate that term) continues to grow, as do those of the other Whisky4Movember team members. To support our ‘tachey efforts you can sponsor us over on the Movember site, throw Richard Paterson some cash instead/as well or buy one of the Movember bottlings from Master of Malt – £8 of the £34.95 selling price will go to charity. Another whisky squad done and another one scheduled. At the time of writing there are still a couple of places left at the Squad Christmas dinner – a three course meal from The Gunmaker’s seasonal menu with some matched whiskies and the usual random banter. Book soon or be disappointed. To be perfectly honest I blame the Australians. It could have been any number of of countries in the southern hemisphere, but in the end it was the Aussies that have set things up ready for a month of pain for me: it is almost time for Movember. Started years back somewhere in the heat blasted antipodean wasteland, Movember is a charity movement dedicated to the cultivation of top lip facial hair during the month of November. As is usual with the charidee the participants approach everyone they see and demand sponsorship for their silly activities, this time the growing of a moustache and no other facial hair (unless it can be considered part of a moustache style). This post is that demand. I’ve had a beard, which includes as part of its makeup a moustache, for coming on ten years. Over time bits of the beard have been removed and regrown (currently the whole lot is in full bloom due to an effort to make my Movember transformation all the more shocking) but the two constants have been chinny bit and moustache. The thing about Movember is that in order to grow a mo’ (an abbreviation for ‘tache that I’ve not heard outside of Movember) you need to not have one to start with, otherwise its more ‘cultivating an already existing hedge’, so I’m looking at Movember from a slightly different place than many of the participants. In short, I’m going to have a shave. And this is where my Australian blaming comes to the fore – what kind of sadistic people would export a charity event that will lead inexorably to the exposing of my usually fur insulated face to the perils of a London winter? Our southern hemisphere summer experiencing far flung former colonial chums. Movember supports men’s health charities, especially focusing on prostate cancer in the UK (one of those fun men’s problems that we generally keep quiet about, even though we moan loudly about the potential of getting a cold), so you could count this as enlightened self interest, what with me being a man and slowly encroaching upon the ages where the probabilities of experiencing many of the health problems in question rises, but you should all sponsor me anyway. My “Mo Space” is where you can go to sponsor me and keep an eye on my ‘tache growing progress through the month. I’m part of a team called Whisky 4 Movember, organised by Whisky Guy Darren Rook and featuring members of Whisky Squad, and we are also going to be doing some whisky related charity shenanigans during the month – there’s a potential for for a fun run (with whisky in hand) as well as some tastings and special Movember bottlings from Master of Malt (here are last year’s – I’ve seen the labels for this year’s and they’re rather nifty). I’ll update here as soon as I hear any details. Anyways, sponsor me, relish my humiliation and do a bit for charity.